Glasslock tempered glass food containers are the perfect choice to store food or cook / reheat in the microwave. Pop leftovers in the fridge or the freezer without the need to transfer it to a new container. This set includes 9 tempered glass containers with BPA free lids. 1 x 405ml and 1 x 900ml Square Food Container. A very useful and beautiful storage set. Easy to clean and the capability to be reliably used in freezer, microwave and oven make them invaluable. I have bought so many different containers in my life but these are the very first that I love! I have even bought more for my family for Christmas. They nest inside each other easily , and the bases can be used in the oven both such great advantages for someone with limited kitchen space. Thank you for stocking these. WE HAVE GLASSLOCK ALREADY FOR YEARS AND AS FAR AS WE CONCERNED THEY ARE THE BEST CONTAINERS AVAILABLE. Couldn't be happier with these containers. Great range of sizes and they nest well for easy storage. They arrived super fast and at a great price too. Can't wait to use them and gradually phase out all my plastics! <EOL>Some reviews have mentioned the packaging being an issue. I thought they were well packaged to arrive safety all in one piece but not take up too much space, predominantly cardboard inserts but yes a couple of plastic/foam sheets but these could be reused. My containers arrives very quickly. I loved the environmentally friendly packaging, including newspaper pages! I haven't yet tested out how leak-proof the lids are but, judging by the seals on them and how well they lock down, I believe that they will keep my bags dry if the containers tip when in them. Prompt service and fabulous product will definitely be shopping with Shop Naturally again. Good range of sizes and shapes, but feel that the capacities provided are either too small or too large for meal-size portions to take to work. The 'nesting' element is a bit redundant as well, as I always store them with lids on so as not to lose said lids. Also agree that the product shouldn't come with so much plastic packaging - there are heaps of recyclable options. Bought these as replacement for 'Lock n Lock' brand, which are now obsolete - cannot find them anywhere online. Feel that the other brand was better. However, the glass is strong and withstands heat well and reduces the need for plastic. Very happy with these - so handy to have a variety of sizes and great to get them on special as I try to get rid of all the plastic in my cupboard! I got the bonus double set. So happy with the product, more sizes than I expected. Perfect for storage of food in the fridge and freezer. Stack well and fit nicely into each other to save space in the cupboard. The containers seal well, no leaks when I travelled with soup to work. Best purchase. Fantastic collection of containers, good variable sizes. I love this set, couldn't be happier! These arrived yesterday - so far really impressed with the speed of delivery, care in packaging and the quality of the product. They are useful sizes and I'm thinking these glass containers will be in high rotation in my kitchen!! Great buy! Great value :) This set is better than I thought it would be. I have been able to store so much in the fridge. 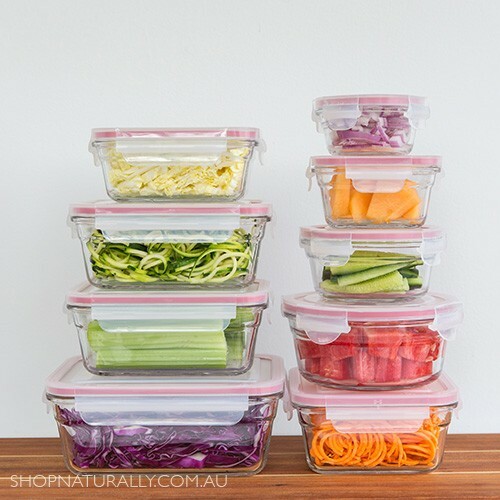 I use these for my weekly food prepping and it's great because I can also use the glass containers in the oven and then put leftovers in the fridge in the same glass container! Saves me so much time not having to transfer from dish to container and so on. And, these are truly leak proof! I soaked rice in one of the bigger containers over night and there were absolutely no leaks as I transported to the fridge and out of the fridge etc even though it was quite full. I will definitely go with this brand again if I need more. So far so good, my set of containers arrived quickly and they seem to be off good quality, I've used them every day since I've received. There are enough that I can keep one in my bag, some in my office and some at home, so I can use for take away and buying in bulk as well to minimise waste. The delivery was very prompt and quick . The Glasslock Oven safe glass food containers are fantastic, I dont know how I lived before without them. Using them for freezing etc. I love these containers. 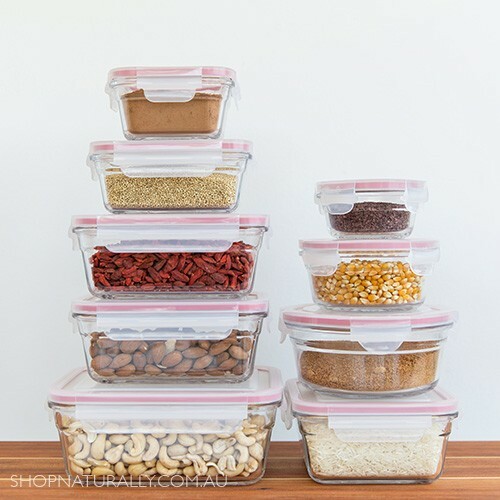 I decided to throw out all of my toxic plastic containers after hearing how bad they are and replaced them with these. Great investment. My New Years resolution to cut down on my family's use of plastic due to environmental and health reasons. I purchased the glass storage containers and removed all my plastic ones, realising they make are great for keeping Lego in! <EOL> I'm so impressed by the quality and the affordability that I have no doubt that I will be getting a second set very soon. Thank you!! These are as good as I'd hoped they'd be. The lids fit really well. I was able to purchase the set of 9 for half price, fantastic value for quality items! I have been wanting to get glass containers for ages to replace my plastic ones, and the deal on this set of 9 was perfect for me to do a big replacement all at once. The set has a really good range of different sizes of containers so I could see what shapes and sizes I wanted to add in, in future. <EOL> <EOL>The glass is sturdy, solid and uniform (no bubbles, lumps or sharp edges) and the lids seal shut superbly. They are require a bit of strength to clip on and sometimes to take off (proof that the suction created by the silicone seal is excellent!) but this could get easier in time, when they are not so brand new. <EOL> <EOL>I love these so much that I have turned around and bought the set of 7 (rimless) which can also nest into this original set of 9 (rimmed) - bonus for storage space saving! <EOL> <EOL>I am super happy with this purchase, great value for money and I've been able to ditch all my plastic containers now I have these. Great service, fast delivery. Products as described. I love these glass food containers and the BPA free lids. They stack well without the lids for easy storage and they are the perfect sizes and shapes for all sorts of foods. Ordering online was easy and delivery was fast. Fantastic product. Arrived well packaged and in a timely manner. These are a quality product, no leaks, solid glass and looks good. Love these dishes ! Purchased some a few years ago and are now really happy to get rid of all the pastic I have in the cupboard now I have my <EOL>new ones! I am very happy with my Glasslock food container set of 7. Great quality, safe to use in the microwave (which is the main reason I bought them) and store food in the fridge and freezer. Delivery was quick and dealing with this company hazzle free. All good! Great product great price ! I want to buy another set soon! Great products. Fast delivery. Very impressed with the service. Great build quality and very solid. I expect these containers to last me for years to come. Will be buying more. LOVE these and will definitely be buying more! Excellent quality. Fantastic little set - good range of sizes included. Hope to order some more soon! A great collection of storage containers with a size of everything. I absolutely love these containers, and was so excited to receive them in the mail. Strong, sturdy, easily stackable, and a great range of sizes. They won't be the last ones I buy, it's amazing how quickly they all get used up! Great product, clips are secure and airtight. Love that they can be used in oven, fridge, freezer and microwave. Very versatile. Stackable. Have thrown out the majority of my plastic containers! brilliant product!!! great for storage, cooking reheating and transporting daily to work my lunches. Just awesome and such good value for money. Perfect for those who don't like using plastic and want something that's oven proof too! So many sizes are included. Very happy with this storage pack purchased to replace all the plastics I have. Easy to keep clean, much healthier and good mix of sizes. This set nicely fills out my collection of Glasslock. Husband takes his lunch to work to reheat. Great that leftovers can go into the freezer. The final step in eliminating plastic from the house. Love these containers. The lids make them super secure and they are high quality glass. I use them to store and freeze. Highly recommended. Well made with solid glass and nice feel to edges and lids. Glad to be able to reduce my use of plastic containers for food. Exactly as per the description, and so much better than the plastic is replaced. LOVE this set! Non toxic alternative to all that plastic! So lightweight, but sturdy. Great to store and reheat in. Look lovely on the shelf. And such a good price on sale here!! Bought the baby set too! Since buying this set of containers over a year ago, I have never had to worry about split, stained, leaching that concerned me about plastic containers. We use these containers for storing and baking - I can't believe I haven't thought of these before and its going to be a very long time before I have to replace them. I love these so much I came back and bought a second set. I use them for leftovers in the fridge, and then put what I don't eat in to the freezer. I have even made single portion lasagne and gone from oven to fridge to freezer and back to the microwave all in the one container. Excellent quality and great range of sizes. Definitely recommend. Absolutely loved this purchase! Super happy with the set. The lids are excellent. I take these to work and back, they roll over in my bags and not a single leak! Fantastic value for money. great price for amazing glass containers!